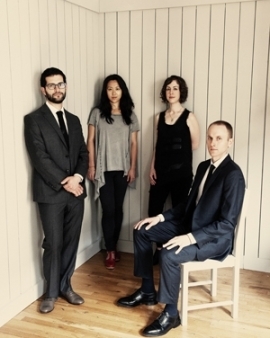 Yarn/Wire is a Queens-based percussion and piano quartet (Ian Antonio and Russell Greenberg, percussion / Laura Barger and Ning Yu, pianos). Noted for its “spellbinding virtuosity” (TimeOut New York) and “mesmerizing” performances (The New York Times) the ensemble is admired for the energy and precision it brings to performances of today’s most adventurous music. Founded in 2005, Yarn/Wire is dedicated to expanding the repertoire written for its instrumentation, through commissions and collaborative initiatives that aim to build a new and lasting body of work. Influenced by its members’ experiences with classical music, avant-garde theatre, and rock music, the ensemble champions a varied and probing repertoire. Yarn/Wire has commissioned many American and international composers including Raphaël Cendo, Natacha Diels, Peter Evans, Alex Mincek, Thomas Meadowcroft, Misato Mochizuki, Tristan Murail, Sam Pluta, Kate Soper, and Øyvind Torvund. The group has given the United States premieres of works by Enno Poppe, Stefano Gervasoni, and Georg Friedrich Haas, among others. As well, the ensemble enjoys collaborations with genre-bending artists such as Tristan Perich, David Bithell, Sufjan Stevens, and Pete Swanson. Yarn/Wire appears internationally at prominent festivals and venues including the Lincoln Center Festival, BAM, New York’s Miller Theatre, River-to-River Festival, La MaMa Theatre, Festival of New American Music, London’s Barbican Centre, the Edinburgh International Festival, Shanghai Symphony Orchestra Hall, and Hong Kong New Music Ensemble’s Modern Academy. Their ongoing series, Yarn/Wire/Currents, serves as an incubator for new experimental music at ISSUE Project Room in Brooklyn. In 2016, the ensemble won first prize in the open category as part of the inaugural M-Prize competition at the University of Michigan. It has recorded for the WERGO, Distributed Objects, Populist, and Carrier record labels in addition to maintaining their own imprint. Yarn/Wire works to promote new music in the United States through educational residencies and other outreach activities.